Blackpool is one of the UK’s most visited tourist seaside resorts. There are plentiful things to do and see and we here at ST Minibus Hire Manchester want you to experience it all hassle free. The Tower Ballroom, The Tower Circus, The Blackpool Tower Dungeon make up just some of the fantastic sights to be seen in just the tower itself. Who can forget about Blackpool’s main attraction; Blackpool Pleasure Beach. 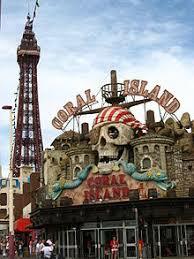 It is the most visited tourist attraction in the UK and in the top twenty most visited amusement parks in the world. What better way to spend your family day out than enjoying the sights and thrills of this magnificent place. Prices range from £22.99 for a day pass (an additional £22 for a Nickelodeon Land pass) and there are even Family Packages available (Prices can vary dependant on booking times and amount of people,) or if rides are not for you then day passes are £6, you can keep an eye on everyones coats. £15.50 per person and £11 for 3-15 year olds (kids under 3 go free!) There are also family tickets available starting at £48 and can vary. Remember you can get discount you book online. Jim’s Indoor Adventure Playground and Blackpool Model Village and Gardens. There are so many things to choose from, you’ll be hard pushed to have a disappointing day out. Let us at St Minibus Manchester take care of your travel needs and erase the pressure to find a parking space or stress about traffic. Kick back, relax and enjoy our Minibuses and let us take care of the rest. At ST Minibus Hire Manchester, we want you to have the best day possible so please get in touch by phone or with our online booking form.